Whether you’ve found an orphaned litter or are starting to transition your foster kitties to solid food, kitten season is the perfect time to learn more about weaning kittens. Summer is the time of year when all living things crop up in droves, including kittens. And many people find themselves faced with little mewling neonatal kitties who need their help. A neonatal kitten is a kitten who is under 4 weeks old and requires around-the-clock care. One of the most important aspects of caring for these youngsters is feeding them. 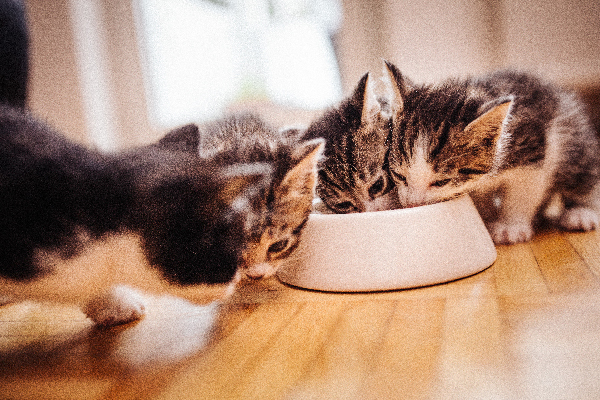 Weaning kittens is a big component of transitioning kittens safely to adulthood (weaning is the process of going from mother’s milk to eating solid foods). Here’s a guide addressing what to do if you find a kitten who is not weaned, including when to start weaning kittens and how much to feed weaning kittens. Don’t take nursing kittens away from their mother — if you can help it. Photography ©ollikainen | iStock / Getty Images Plus. Before taking a seemingly orphaned kitten away from the area you find him, make sure that the kitten is definitely abandoned. The worst scenario is taking a kitten away from his mother before he is weaned — if it’s avoidable. 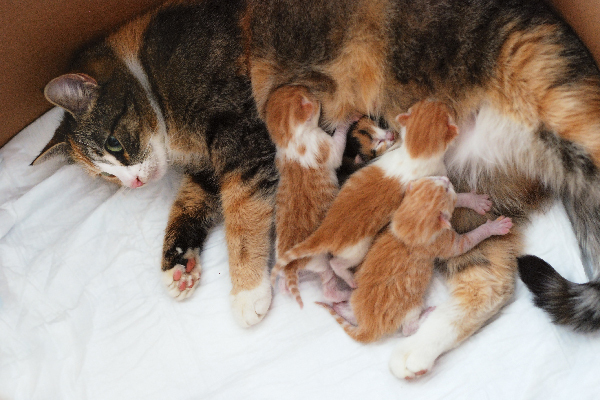 Kittens receive an immunity boost through the colostrum in their mother’s milk. In addition to nutritional reasons, kittens should also stay with their mother for the key developmental cycle of their young lives. So, again, you can rescue a neonatal kitten and safely raise him, but the best situation for the kitten is to stay with his mother if possible. Found a truly orphaned kitten? Is he looking at you? Unopened eyes indicate the kitten is under 10 days old. Check for teeth. A kitten’s baby teeth appear around 3 weeks of age (no teeth = bottle feeding only). Weigh the kitten. Kittens gain about 1 pound per month; a kitten under 1 pound is unweaned. Ambulatory? Walking occurs around 4 weeks old. 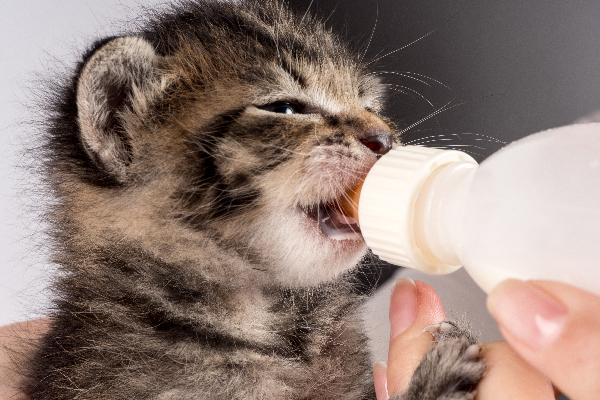 Kittens who are under 4 weeks old are still nursing and require bottle feeding. Below is a guide to feeding kittens depending on body weight. A postal scale works best to weigh the wee ones. Remember, unweaned kittens can only drink kitten milk replacement (usually procured from the pet store), should only be fed with their bellies facing downward and need to be stimulated to eliminate (the Mayor’s Alliance for NYC Animals outlines the do’s and don’ts). Not all milk is created equal! A big mistake new foster parents make is to feed unweaned kittens cow’s milk or any other kind of milk that is not specifically kitten formula replacement. Under 1 week old: kitten weighs less than 4 ounces. Feed formula: every two to three hours. 7 to 10 days old: kitten weighs 4 to 6 ounces. Feed formula: every two to three hours. 10 to 14 days old: kitten weighs 6 to 8 ounces. Feed formula: every three hours. 14 to 21 days old: kitten weighs 8 to 12 ounces. Feed formula: every four hours. Kittens are usually fully weaned at 8 weeks old. Photography ©wundervisuals | iStock / Getty Images Plus. 4 to 5 weeks old: kitten weighs 12 ounces to 1 pound. Feed mix of gruel/formula/kitten kibble: every four hours. The gruel consists of canned kitten food mixed with kitten formula with a porridge consistency. Over the coming days and weeks, as the kitten eats with more gusto, his gruel will have less kitten milk formula and more canned kitten food. 6 to 7 weeks old: kitten weighs 1 pound to 1 pound and 8 ounces. Feed mix of kitten kibble and wet food four times a day. 8 weeks old: kitten weighs 1 and a half to 2 pounds. Fully weaned. While weaning kittens, it’s crucial to keep up the feeding protocol until they are 2 months old. Once they’ve fully transitioned to solid food, it’s also imperative that the kittens still be fed a high-quality dry or wet kitten food. According to Kitten Rescue Los Angeles, the best kitten foods have no meat by-products and minimal (if any) grains or corn. Weaning kittens properly is the cornerstone to a happy adult cat — it might take some extra time, money and energy to get it right, but it’s the best insurance to secure a future healthy feline. Thumbnail: Photography ©Dobroslav Hadzhiev | iStock / Getty Images Plus. What Is Fading Kitten Syndrome and Why Do So Many Foster Kittens Die From It?